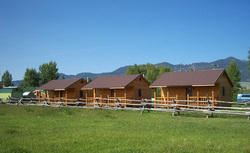 Elijah's Rest is a cabin and breakfast business offering you competitively priced accommodations. Individual cabins include full private baths and a private porch to view the surrounding mountains in a relaxed atmosphere. We are located just minutes north of historic Virginia City and Yellowstone National Park is a pleasant ninety minute drive. Other exciting area destinations include the Lewis and Clark Caverns and Big Sky ski resort.